Confession time: Yesterday, I bought my first bottle of wine to consume at home for us and not a celebration like Passover (where I always drink grape juice with the kids). Some people may be shocked with this considering I am 30-something. It’s not that I will not drink beverages with alcohol, it’s more or less that I have never found anything that I like enough. A lot are too strong, too sweet, too dry or something else. There is also the money factor. As a foodie, I would much rather spend my moolah on something food related than empty calories that I drink. You see, the boys do not like carbonated beverges. Thanks to this, we pretty much only have water and some vegetable juice options in the house. The other night, I mentioned that I wished I had something in the house to drink. I wanted something to help me relax, but had nada. My friend Danny is the wine guru. She suggested that I try a peach wine. Hmmm…..I LOVE peach everything. This really intrigued me since I have fond memories of trips to Canada where I ordered Peach & Tea drinks (ice tea with peach schnapps – YUM!). 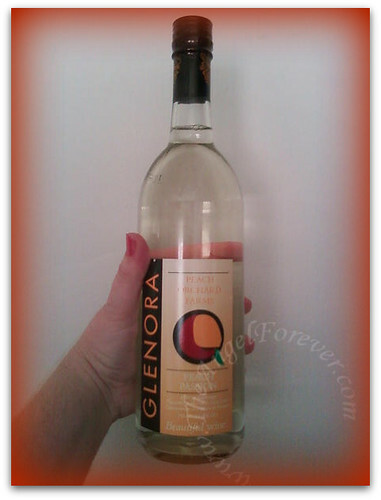 It is a peach wine from Glenora in the Finger Lakes region of New York (always nice to support the home state). I figured I would give it a shot and bought it. After I paid for it and was putting it under the stroller, I stood up and lost my balance. As I did this, I crashed my nose into the hard pastic on the stroller – ugh! Last night, when the kids went to bed, TechyDad and I had our peach wine in classy clear plastic cups. (The wine was not kosher – GRRRR.) We sat on the couch drinking it while watching Hot in Cleveland. All I can say is that it was delicious. It was not too sweet, had a great peach flavor and did not sting when it went down like wines often do to me. We will definitely buy this again and may try some of the other varieties. If you have any other wine suggestions, I would love to know. It’s not like I am going to drink often, but variety would be nice. Thank you to my friend Danny for the suggestion – you rock! P.S. Be sure to enter my two current giveaway for Breyer’s Smooth & Dreamy (4 winners) and for the book Potty Animals (5 winners). Oh and TechyDad is also having a $25 gift certificate giveaway for ABC Neckties! You might want to try a wine from the Great Lakes region like Catawba (sp?) Islands. I’m not a drinker normally. It’s either too late, or some excuse…but I DO LOVE wine! I meant to comment on this yesterday – so I am sorry I am a day late. I LURVE local wines….and especially fruit wines. In fact, whenever we travel, whether it be the hubby and I or a trip with the girls, I make it a point to seek out local wineries. All 50 states in the US have them and we have come across some pretty incredible wines. You would probably also like a Moscato wine…its sweeter than most, but not too sweet and very refreshing. But definitely check out more fruit wines. We have 2 wineries down here that mainly do mostly only fruit wine. One has a Strawberry Riesling that is to die for. My last thought I wanted to share with you is that wine takes on a totally different part of your palette when you enjoy it with food. It took me a long time to learn that. For the longest time I didn’t like red wine, until I had it with the right food. I highly recommend learning what wines go with which foods and try it….it enhanced the wine and the food! If you want something sweet, fruity and light (and kosher! ), the Golan Moscato is a must. I’m not a fan of wine, but this (and Israeli Emerald Reisling) are at the top of my list. Devo K´s last blog post ..Help someone return a camera!